The script, which runs on Photoshop CS2 or later, should work the same on both Windows and Mac, although I'll show screenshots of it with Windows. 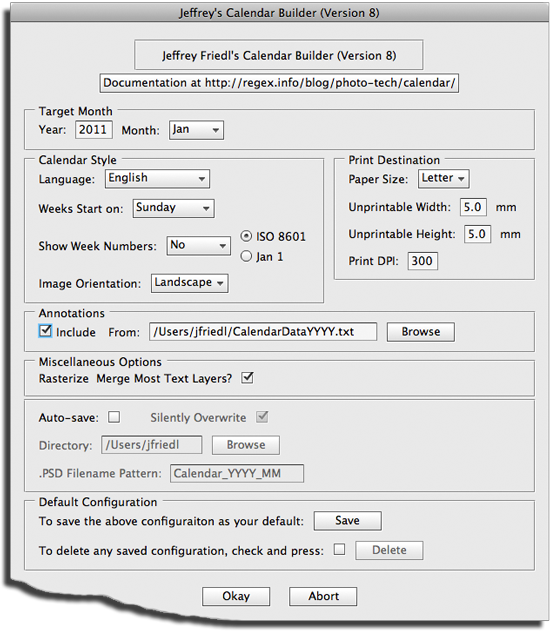 Running the script brings up a dialog which allows for calendar configuration (page size, etc. ), but a copy of the script can be edited itself for fine-tuned control over fonts, sizes, margins, etc. The result of the script is a Photoshop document with a dozen or so layers, which can then be modified/tweaked. My goal in building this was to make landscape-mode loose-leaf calendars that my wife and I can use for our daily/weekly schedules (e.g. “preschool field trip is tomorrow”, “such-and-such a friend visiting on Sunday”, etc.). As such, I want something that is a calendar when viewed up close.... yet, when viewed from afar, it's art. That's the goal, at least. At its most simple, just select the target year and month (or select the month “All” to build 12 separate calendars), adjust the calendar style settings and the paper size to your liking, and press the “Okay” button. The script will churn away a bit, building the calendar in a new document, leaving you with a dozen or so layers like those shown at right. Layers making up the calendar include text layers for the month and year text, rasterized layers with text for the names of the days of the week (“Sun-Sat” in the example at right) and dates (“1-31” in the example), and the calendar grid. There's an empty layer named “Paste Your Photo Here” which is where, of course, you should place the photo you want to use. Actually, it needn't be on that layer, but simply within the “Picture Mask” layerset, as the mask provides a pleasing (to me, at least) drop off toward white all around the edges. As a shorthand, if you have an image open in Photoshop when you invoke the script, it will be placed within the “Paste Your Photo Here” calendar layer, resized so that it fully fills the canvas. This works only when the already-open document has just a single layer. If you don't care for the automatic resize, you can just delete the layer and replace it with one you like. In any case, once you drop in your picture and move/resize to suit your taste, by all means, adjust the mask as well. Sometimes it works well when the image extends all the way to the edge, and sometimes it's better to reduce the image to the center only. There's an “attrib” layer with an attribution for the calendar. The script puts the url for this page there, but you'll likely want to change that to your home page, a copyright notice for the image, etc. Or perhaps just get rid of it. It's up to you. There's also an “Image Description” text layer whose visibility defaults to off. It's just one idea for an image-description note: replace its text with an image description or any text of your choosing (I used “Natalie and Alan, July 14, 2006” in the first example above) and make it visible. It'll show up in the lower-right of the image. You own the copyright for any calendar you make. I own the copyright on the script, but not on its output. You can change the output — the document the script creates — in any way you like. Of course, if you add a photo to the calendar, as with the use of any image, be sure you're allowed the use the image. Choose English for the month and day names, or select from among: Afrikaans, Albanian, Amharic, Arabic, Armenian, Basque, Belarusian, Bosnian, Bulgarian, Catalan, Chinese, Cornish, Croatian, Czech, Danish, Dutch, Estonian, Finnish, French, German, Greek, Gujarati, Haitian Creole, Hawaiian, Hebrew, Hindi, Hungarian, Icelandic, Indonesian, Irish Gaelic, Italian, Japanese, Korean, Latin, Latvian, Lithuanian, Luxembourgish, Maori, Norwegian, Polish, Portuguese, Romanian, Romansh, Russian, Scots, Serbian, Slovak, Slovenian, Spanish, Swedish, Tamil, Thai, Tok Pisin, Turkish, Ukrainian, Vietnamese, or Welsh. I pulled most of the language data from this page, and had to take a guess at what font to apply for many of them. I don't even know whether some of those are real languages. Please let me know if you run into troubles. In the dialog, the selection for Show Week Numbers can be changed from “No” to “at Left” or “at Right,” to indicate that you want week numbers and where the extra column should be placed. You can also select between the two methods for counting weeks. 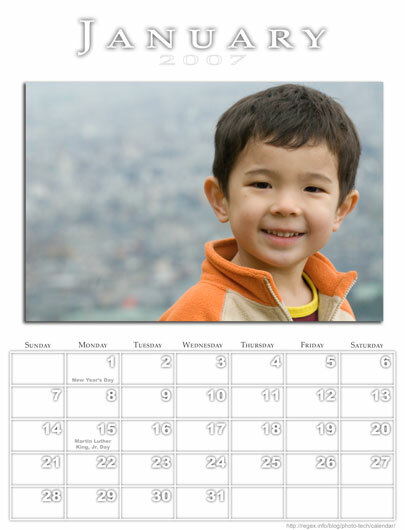 Image orientation does not refer to how you load the paper in the printer, but to what style of calendar to make. The example at the top from my brother's wedding is in Landscape style. The example with my little boy is in Portrait mode. Annotations (adding holidays, birthdays, etc.) are covered in a later section. This option is turned on by default, and compresses the many individual date-number layers (“1”, “2”, ... “31”) into one layer by rasterizing and merging. The same grouping is done for the day names (“Monday”, “Tuesday”...) and the week numbers, if you've requested them. The advantage to this is that you can then adjust the look and feel of all the dates (or days or week numbers) at once by adjusting the style of the merged layer. The disadvantage is that you can't adjust the font or size of the text, or other text-specific things, because the individual text layers no longer exist. Thus, by unchecking this option, you can choose to leave the individual text layers intact. When this is done, they're put into their own group to reduce visual clutter in the Layer pallet. When auto-save is turned on, the newly-created document or documents are automatically saved to files. The Directory element indicates where they should be saved to, while the PSD Filename Pattern indicates how the files should be named. Within the filename pattern, the sequences “MM” and “YYYY” are replaced by the month and year numbers of the calendar (two and four digits each, respectively). For example, with a pattern of “Calendar_YYYY_MM”, the calendar for April 2013 will be named “Calendar_2013_04.PSD”. If you tend to always want options that differ from the defaults (different language, paper size, etc. ), then set them as you like and press the “Save” button in the “Default Configuration” section of the dialog. It writes your selections to a file that's read automatically when the script starts. Pressing the “Delete” button deletes that file, so you end up with the as-downloaded set of defaults. For safety, you have to first check a box to enable the delete button. Because some layers are rasterized, it's best if you can print at exactly 100%, with no resizing. This should be automatic if you select the proper paper size, DPI, and reasonable page margins. I have a Canon XP810, and find that Canon's “High-Resolution Photo Matte Paper” MP-101 to be perfect. It looks and feels like normal printer paper, albeit of a bit heavier stock. It's 100% Matte — not a bit of glossy, so you can write on it with a pencil or pen. You can have the script add annotations to certain dates, based upon lists found in external files. The support for annotations is rudimentary at best, but it's useful for marking holidays, birthdays, and other dates that might be important to you. Blank lines and lines beginning with “#” are ignored. The annotation itself may have “<BR>” to force a line break so that the annotation appears on multiple lines in its date box. Annotation lines may prefixed with special “[...]” settings, as described below. Dates without a year apply to a calendar of any year, while those with a year apply only to calendars made for that year. This allows you to add year-specific items to the annotation file without worrying that they might show up on a different year's calendar. Changes the font for the annotation to the one whose name is given. You must use Photoshop's internal name for the font, which is often not apparent from the name presented in the font dialog. See my post on discovering Photoshop internal font names for the name to use here for any given font. By the way, be sure to use the ASCII or UTF-8 character encodings for the file. [FontColor=100%,0%,0%] 6-18  Red Letter Day! Sets the font opacity (100% is normal, 0% is invisible). If these special settings appear on a line without annotation data, as the first FontColor line in the example at the top of this section, the setting applies to all subsequent lines. You can surround a group of settings and annotations with <CONTEXT> ... </CONTEXT> to isolate any settings made within the group from applying after the group. IMPORT is used for the Japanese Settings file (font changes, etc.) so that those changes remain and apply to subsequent lines (those found in the two INCLUDE files that follow). This allows you to create sets of annotations that you can then easily mix and match when creating specific calendars. I use different sets of files depending on whether I'm making a calendar for myself, my folks (who don't read Japanese), or my Japanese-speaking in-laws. To make it easier to reuse annotation files year after year, you can put the year in an individual entry's date so that it is safely ignored when creating a calendar for a different year. You can also segregate items into different files, putting year-specific annotations into files with the year in the name. In filenames provided on include/import lines and in the script's configuration dialog where you provide the annotation-data filename, any set of four upper-case 'Y' in a row are replaced by the target year for the calendar. The default filename is “CalendarDataYYYY.txt” which means that “CalendarData2010.txt” is actually read for a 2010calendar. You can find lots of info on holidays for countries, religions, and cultures around the world at TimeAndDate.com, and, of course, at Wikipedia. Putting the small previous-month / next month calendars in there somewhere. Add a variety of layout options. I can't help wondering whether there's a feature of Photoshop whereby I could leave all the text unrasterized, yet allow one-stop tweaking of fonts and margins. With my understanding as it is now, if all the date numbers are left as individual text layers, each must be visited individually to, say, change the font. If there's a simple solution to this, please let me know. At least with this script, you can make the change in the script, just once, and then run it. Fixed a misspelling in the dialog. Updated the Hebrew translations. Fixed a bug in the processing of the calendar-data filename. Turns out that a month could end up being a day short if daylight savings time ends on the last day of the month (as it does in Norway in 10/2011). Thanks to Arve Hansen for the fix. Added support for Lithuanian. Tidied up the opening dialog a bit. I made these changes over a year ago, but forgot to release it as a new version. Doh! I also fixed the default year computation: in the 2nd half of the year, it now defaults to next year. Changes suggested by Ingus: fixes to Latvian translations; handle multiple line breaks on an annotation line. Although I added A3 and A5 paper sizes in the previous release, I hadn't really tested them, and it turns out that I forgot to scale the various font sizes and item spacing that I used for A4 and Letter paper. This release fixes that. Per request, I added A3 and A5 sized paper selections. Per request, you can set weeks to start on any day, not just Sunday or Monday. Fixed the “February becomes March” bug. Can now create calendars in 58 languages. Added ability to display week numbers. Added ability to change annotation font name/size/color/opacity. Added ability to force linebreaks in annotation text. Added import/include/<context> support to annotation file. Annotation filename specifications with “YYYY” auto-convert to the calendar's target year. Can now include the year in an annotation's date, and have that entry be safely ignored for other years. Added annotation data filename to the config dialog. Added tool-tips to the configuration dialog. Added ability to save the current configuration as the local default. Added ability to turn off annotations in the config dialog. Can now leave text layers un-rasterized and un-merged. Added the ability to populate the calendar with holiday/birthdays/etc data read from a file. Added an “auto save” feature, particularly useful when generating whole-year templates for distribution. Fixed the “weeks start on Monday” option, which had been broken when building all months in one shot. Fixed the pre-set margins and such for Portrait mode actually work properly (see an example above). It now references only fonts that come standard with Photoshop (as of CS2). I thought that's what I'd done, but it turns out that I had some other fonts (perhaps from CS1, or from other Creative-Suite programs). Hi Jeffrey- just a quick note. I’m trying to alter the calendar sizing to a custom 340×340 in the psd. Also in the dialog box there is a typo “configuraition” in the save as default. Great script – custom sizing in the dialog box would be a good option. Would like to see a yearly option on this script, or another script. Also another option would be to change font on build. Great script. Thank you for making this available. Learned a ton just by looking at your code and techniques. Adding the previous and next months somewhere on the calendar would be a great addition. Thank you so much for making this helpful script available for download! how can i create a two months per page calendar? I just found this, but I want to thank you. This worked like a charm for me. I’ve been looking for over year now for a calendar script, which can put the dates in only one or two lines under a very large image. Something like a fine art photo calendar. Can this script do this? I have quite a few of your lightroom plug-ins, this would relly help. Can you use annotations for your calendar builder, using a Mac Computer? How do you make an annotation file and where do you place it. I have a Macintosh computer. what a great calendar. I use it since 3 years. Will there come a update for the “Pre-built zip archives of sample PSD files” with the next 3 years (2016, 2017 and 2018) ? Good Morning, first of all I would like to thank you for your magnificent calendar. For three years I use it regularly and it is fantastic. Unfortunately today I find myself having to organize 2016. I wanted to ask if it was possible to update the template for the next years. Thank you. From Hollis, NH, USA Many many thanks for your comprehensive and valuable calendar script. I have used it every year since 2007, and love it!! Hello Jeffrey. Writing from Australia. I have been using your Calendar Builder for a number of years now. I am stumped about how to change the height of the grid/days/dates so that my photos fit into the space between the month/year and the grid. Could you help me please. Thank You for creating such a cool and useful tool. Many may not appreciate just how great this is until they have to try and design a calendar. Its pretty surprising after all these years, the most common Calendar creators are programs like Print Shop and Calendar Creator. I remember using those 20 years ago and nothing we have today is any better now! Except your tool of course, thank again. Hello! 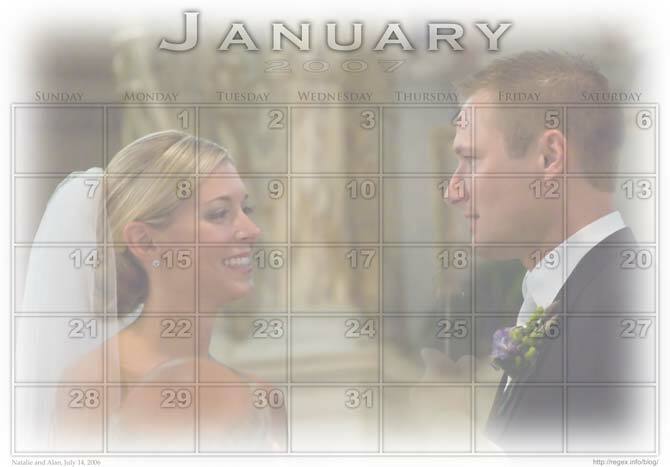 I was searching the net for a calendar template and came upon yours. Great tutorial! I was wondering if it were possible to remove the dates and just have a regular blank calendar? I was hoping to use this as a reusable calendar that could be laminated and used over and over again. Thanks for sharing this amazing script. Searching from many days. I cannot find any working on other site. amazing calendar scirpt. I have a question for you. Our soccer league is looking for fundraisers. We have thought about using your program are part of the process. Is there anything special permissions we need? Or do you have questions? Thanks for this! I spent a couple hours editing the script and was able to change it quite a bit to tailor it for my needs. Great job commenting all the code, that was very helpful. I just finished watching a few hours of RegEx videos, it took me a while to notice the url of your site, and then to see you wrote a rather long book on RegEx, and that there is quite a bit of RegEx in the script. I can’t quite wrap my head around how it is working, but it is a very neat example. Thank you! I think this is what I need to custom produce my family’s calendar for Christmas this year! Note – wekks changed to 5 and six !!! We used your template for a very successful calendar last year – Many thanks . However we used a 5 week calendar and the days of the 6th week are entered onto a split day on the fifth week. There has been a request for this year’s calendar to have the 6th week days on the the top line ( the first week). Would it be a simple enough job to alter to JS file ? I have some knowledge of it and could do the necessary if you pointed me in the right direction !!!! Hi Jeffrey, many thanks for your script. I use it for the last 2-3 years. Now i’m trying to implement my work with little changes. To make “sunday” in red i use the Paint Bucket tool to fill the “rasterized number”. I read in previous comments that you can’t do this by code, maybe it can do a fill/rectangle in the grid on the right? I don’t know. Another change…i’ve use the “CaledarData.txt” with a special font (find on the web for free) to insert moon phases (only new & full moon) and birthday of my friends/parents (after i put a small picture on the right day). Anyway many thanks again! Thank you so much for this script. I’ve been looking for it for days! It works well. Just want to add my thanks to the list. I have been using your calendar template for the last three years and loving it, as I find it a great way to send photos of our travels to the children, and it is great for us to write on a personalised calendar. So easy to use and modify too. I like the calendar. If I put in that my language should be Hebrew, will I be able to get a Hebrew-Lunar calendar?